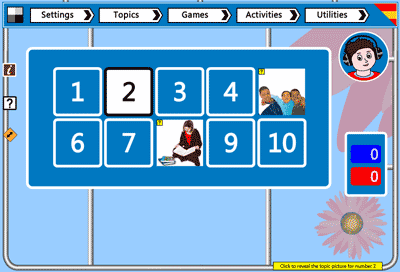 Use our whole class games to reinforce the Spanish your pupils have been studying. To access a game simply select it from the Games sign at the top of the interface. If there are custom label texts available for your selected topic, you will be offered the chance to use the custom labels rather than the default labels. This will only happen if you have selected to show help texts on the settings page. Revise grammar points e.g. students say the word in the plural form, or with the correct article, or in a sentence related to the picture in a specific tense, or as a question, or as a negative sentence, etc. A number of sentences for each picture, etc. In many games, winning is signalled by the appearance of your selected character dancing to music. Click on the character to switch the music off / on. 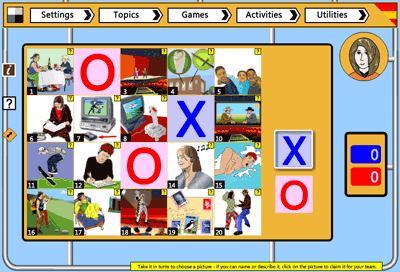 Mix and match is a simple game of matching pictures to texts. Teams compete to win a given number of points by dragging the picture block into the correct storage box. Classic memory game usually played individually with a pack of cards. 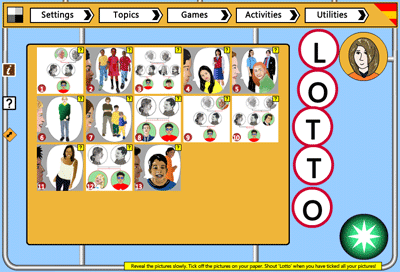 In our version of Pelmanism, instead of playing cards each cell is occupied by a picture from a selected topic, and it is a team game. Commonly played on paper between 2 players. In our 'Four in a row', teams compete to name pictures and win cells trying to get 4 of their symbols in a row either horizontally, vertically or diagonally. Great old game played on paper between 2 players. 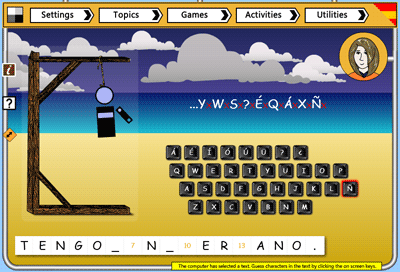 In our Hangman, the whole class plays against the computer, or in teams against each other. 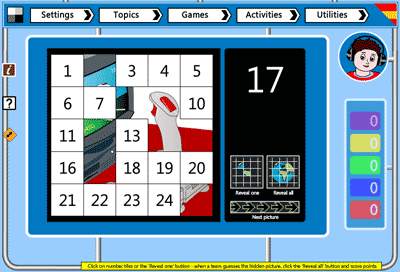 Blockbuster style whole class game for 2 teams. Teams are attempting to make a path of their honeycomb cells across the board by naming or describing the pictures. One person thinks of a number within a given range and the rest of the class must guess it... The game can be played in teams or with no scoring as individuals. Pupils play individually. Each selects a set of pictures and writes down their names. The pictures are hidden then randomly revealed - pupils tick off their pictures and the first to tick off all their pictures shouts 'LOTTO' to win the round. Teams take it in turns to reveal a picture behind a number selected from a grid. 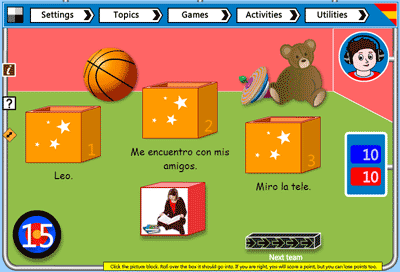 They must and or describe the picture in the target language to win points. 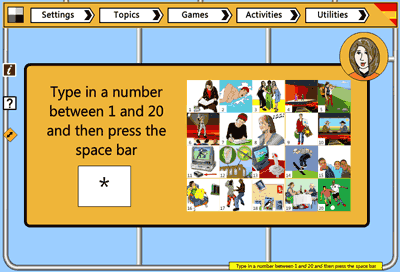 A topic picture is hidden then gradually revealed a piece at a time by clearing number tiles. Teams or individuals compete by attempting to name the picture before it is completely exposed. 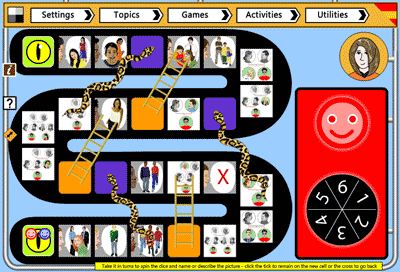 Our snakes and ladders whole class game - up to 4 teams roll dice and climb the path avoiding the snakes and climbing the ladders. Exiting game that ends a class on a high!